John at 989-781-2928 or 989-397-6803. stored indoors replaced motor 2004 low hrs canvas and side curtains good condition. 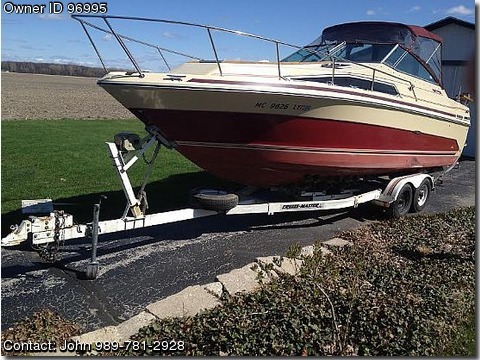 1986 sea ray 268 sun dancer with 1988 cruise master roller trailer with electric winch , custom enclosure canvas bimini top side curtains and rear curtain totally encloses helm area great for cruising in cold weather.260 hp mercruiser . replaced 2004 low hrs. alpha i/o drive replaced 1999.